Awe! That was such a great tribute to Muddy!! Muddy was ginormous! Delilah, you wrote a good tribute to Muddy. 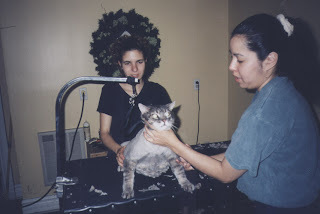 I am suer he was a wonderful Giant of a cat! I know you and Samson help mom through the tough days! What a ManCat with a marshmallow soft face. I can see why he was so loved! Muddy sounds like a wonderful cat and looks, from his facial expression in the first picture, like he is not a mancat to be messed with. The second picture made my mom laugh...it made me shudder...Eeeek! That would be very scarey. My brother Tommy is 20 lbs and is very tall, long and has a big fat head...hahaha...he's a fat head...chuckle..chuckle. Bye for now. Muddy sounds like he was a great kitteh. Man Shadow and I could stand on each others backs and still not reach the moms waist. 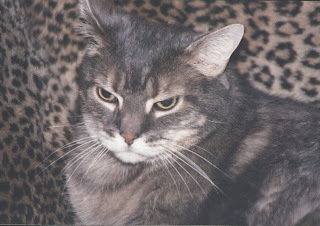 Muddy was surely a great big kitteh wif a soft heart. Delilah your tribute to Muddy was great - glad to hear you and Samson help mommy through her missing him. As for the shaving, my mommy threatens to shave all my beautiful fur off too but because she says I'm too obsessive about being brushed. As if! I just can't help it, it feels so good when she does it! And frankly I don't think twenty times a day is at all obsessive. The Mudman was a very handsome boy. I'd be honored to make a cat angel in his likeness. Thanks for finding The Cat in the Clover!